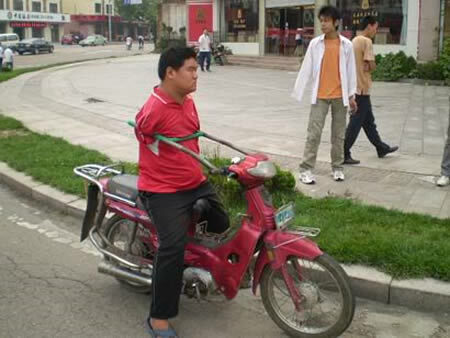 A motorcyclist received a caution from police officers in China - for riding with no arms. Officers in Jimo, Shandong province, stopped the motorcycle for being overloaded - but were shocked when they saw the driver, reports the Qilu Evening Post. Liu, 27, lost both arms at the age of seven after an electric shock. When he was 10, his parents sent him to a local circus to learn skills, and from then on, he trained himself to ride a motorcycle without arms. Liu admitted that he had been riding his adapted motorcycle for 10 years without arms - and he didn't even have a license. He said the circus where he worked had closed down three years ago and he and two other disabled circus workers had been performing on the streets ever since. Police decided against fining him because he didn't have any money but issued him a serious warning. Liu promised them he would not ride motorbikes again.